Now that autumn has descended upon the Greater Philadelphia Area, it’s time to think about how you’re going to remove all of the leaves building up in your home’s gutter. If you don’t have the time or ability to unclog your gutters, it’s important to have someone else do it for you. Otherwise, you run the risk of experiencing a roof leak – believe it or not, clogged gutters cause 85% of home and residential leaks. Not only will a roof leak lead to property damage, but it will also cost you far more than hiring a Main Line leaf removal service. So who should you choose for the job? The easy answer is Squeeky Clean Services. For years, our customers have been very impressed with our ability to deal with tree damage, leaf buildup, gutter clogs and much more. 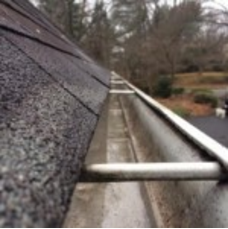 We’ve worked on virtually every type of gutter system out there, which means we know how to clean, flush or repair your gutters effectively. In addition to being highly skilled, Squeeky Clean’s contractors are also committed to providing only the best customer service. We offer the lowest possible rates for our services, and we’ll go out of our way to improve your home or property in whatever way we can. Sound too good to be true? We promise it isn’t – otherwise, we wouldn’t promote it! Hire Us for Leaf Removal on the Main Line Today! If you’re ready to take action against leaf buildup, it’s time to schedule an appointment with Squeeky Clean for Main Line leaf removal. To get a free estimate, just give us a call at 215-836-9274 or contact us online. Furthermore, visit our blog to read up on our epoxy flooring installation service. We look forward to showing you why we’re known as the company for leaf removal Main Line residents trust in the fall and all year round!